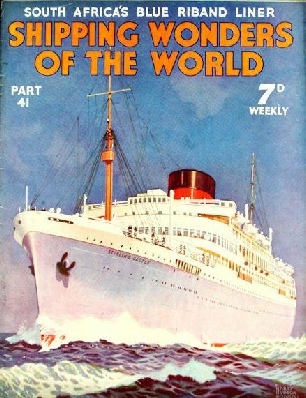 Part 41 of Shipping Wonders of the World was published on Tuesday 17th November 1936. This issue included a colour plate illustrating the RMMV Stirling Castle. It formed part of an article on this ship. The plate was attached to page 1308 of part 41. This week’s cover shows the Stirling Castle, which recently made a record passage between England and South Africa, and is dealt with in the chapter which begins on page 1307. The illustration is by Harry Hudson Rodmell. THE STARBOARD ENGINE of one of the world’s largest motorships, the Britannic, described in part 26. 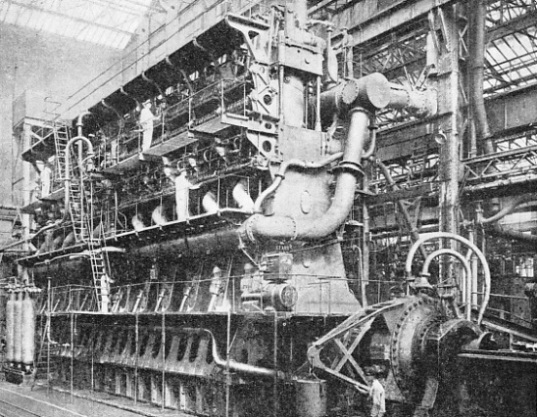 The engineers standing in the foreground and on the platforms indicate the great size of the powerful engine, which is of the four-stroke cycle double-acting type with ten cylinders. The Britannic’s engines, of the Burmeister and Wain type, were built by Harland and Wolff, Ltd, of Belfast. Iron ore is one of the most difficult cargoes in the world to carry, because it is so dense and puts a ship down to her load marks without actually filling the hold. The higher the iron ore in any given hold can be raised above the bottom of the ship, the better she is in a rough sea. But as a large number of iron ore carriers do not take any other kind of cargo, but run light from their discharging berth back to loading berth, it is necessary to provide adequate immersion for their screws. Big ballast tanks are necessary for this purpose and there has been a tendency to raise the bottom of the hold, placing at the same time ballast tanks underneath. The drawing below shows one of two ships owned in Sweden, built in Germany and operating on a long-term charter to the Bethlehem Steel Corporation to carry iron ore from an open roadstead in Chile, known as Cruz Grande, to Sparrows Point in Maryland, USA. They spend their working life running between these two terminal ports, through the Panama Canal. 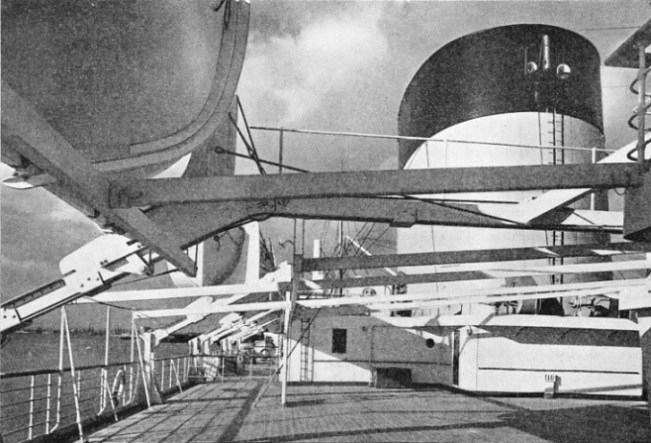 The ships, the Svealand and the Amerikaland, are really three huge boxes, surrounded by water-ballast tanks, with a ship-shaped forward end and a propelling motor-room at the after end. These vessels are two of the biggest in the world with machinery aft. The Svealand was built at Hamburg in April 1925 and the Amerikaland in June 1925. Either has a deadweight tonnage of 21,000 and a gross tonnage of about 15,355. They have a length of 561 ft 4 in, a beam of 72 ft 3 in, and a depth of 44 ft 1 in. With their three big box cargo holds fully loaded with ore they draw just over 34 feet of water. Propulsion is on two screws by means of two four-cycle diesels built in Germany. Either engines has eight cylinders of 29.12 in diameter and 47.25 stroke. The engines develop a total of 4,850 bhp at 115 revolutions. When fully loaded the ships can motor at about 11 knots burning 20 tons of fuel a day. This is the thirty-first article in the series Merchant Ship Types. Concluding part of the chapter by Lieut Com. E Keble Chatterton on one of the most famous of the Q-ships. This is the fifth article in the series on Mystery Ship Adventures. The article is concluded from part 40. You can read more about the story of the Penshurst in chapter IX of the author’s book Q-Ships and Their Story. 32 ft 8 in, and her depth 14 ft 2 in. 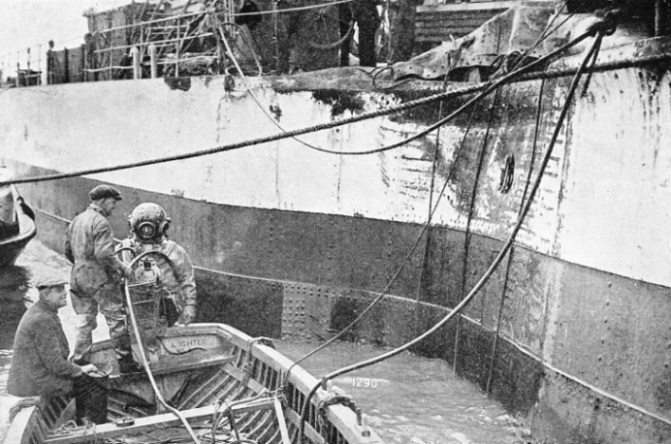 Attempts to overcome the dangers of diving have been made from the earliest times, and there have been many primitive types of diving suit, but it is only in the last hundred years that developments have enabled men to work in safety at great depths. This chapter is by Frank Long. As with the Clyde and West Coast of Scotland passenger paddle steamers, the packets that maintain services between London and neighbouring holiday resorts have a history which goes back to the first years of steamships. Many London readers, and many who have visited London from time to time,must have taken one of the excursions on the paddle steamers which ply up and down the Thames. The service of paddles steamers on the river dates back to 1812, and began with the little 50-tons steamer Richmond. In this chapter, Frank Bowen traces the history of passenger-carrying boats on the Thames from that early beginning right up to the time of the magnificent modern vessels which carry on the tradition to-day. His story recalls many stirring incidents of the past. It brings back the Princess Alice tragedy of 1878 and links up with the undying story of St George’s Day, 1918, and the attack on Zeebrugge. One of the little ships used in that attack was the Daffodil, which had formerly transported passengers across the Mersey ferry between Lancashire and Cheshire. For her service in the Zeebrugge exploit she was given the title of Royal Daffodil, and afterwards she went back to her ferry work at Liverpool, with her companion, the Royal Iris. A year or two ago she was bought by the New Medway Steam Packet Co., And brought south for service on the Thames and Medway. It has always seemed to me fitting that this little vessel, after her “one crowded hour of glorious life” in the service of her country, should have returned to her everyday work, and continued to do it for more than twenty years. THE SPACIOUS BOAT DECK of the Stirling Castle is dominated by the brightly-coloured streamlined funnel. Here passengers to and from South Africa enjoy to the full the sea air and sunshine. There is accommodation for 297 first-class and 492 cabin-class passengers in the Stirling Castle, in addition to accommodation for a crew of 414. AT THE ANNUAL THAMES BARGE RACE, described in part 23, Thames packets often act as committee boats and grand stands. This photograph shows the famous Royal Daffodil at the 1934 barge race. Built in 1906 for the River Mersey ferry service, the Daffodil won fame for her part in the Zeebrugge action on St George’s Day, 1918. Now known as the Royal Daffodil, she belongs to the New Medway Steam Packet Company. A twin-screw vessel of 482 tons gross, she has a length of 152 ft 1 in, a beam of 40 ft 7 in, and a depth of 11 ft 3 in. 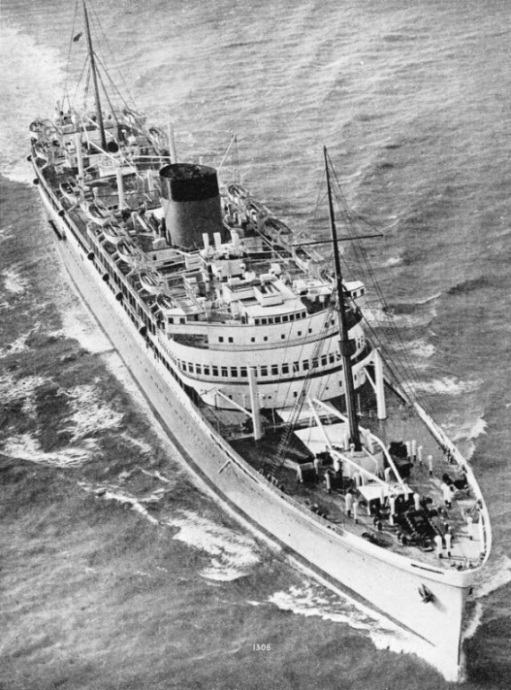 A new record in the history of the South African mail service was established on September 4, 1936, when the motorship Stirling Castle broke the existing Southampton to Capetown speed record by more than thirty-six hours. She covered the distance in under fourteen days, thus breaking a record which has stood since 1893, when the Scott made the passage in 14 days 18 hours 57 minutes. This chapter is by P. R. Bird and besides a comprehensive survey of the Stirling Castle herself, includes a short note on the development of the mail service to the Cape. This the tenth article in the series The World’s Largest Ships. AFTER A COLLISION in the Thames estuary. The British steamship City of Lancaster, 3,040 tons gross, had been in collision with the oil tanker San Gerardo, 12,915 tons gross. The City of Lancaster suffered considerable damage, her engine-room and after hold being flooded. She was beached off the West Oaze Bank and a diver went down to see if by fitting patches it would be possible to refloat her. This is but one instance of how a diver’s work is of value not only in an emergency, but also in ordinary routine. One of the most striking features in the recent history of shipping has been the development of the motor-driven ship. Although the steam turbine is preferred for some purposes, the use of motor engines offers many advantages for passenger and cargo vessels. This chapter, by F E Dean, describes the development of the motor engine. It is the tenth article in the series on Marine Engines and Their Story. CAPTAIN HOLMES’S FIRST COMMAND was the Leucadia, and his own portrayal of her under full sail is reproduced above. 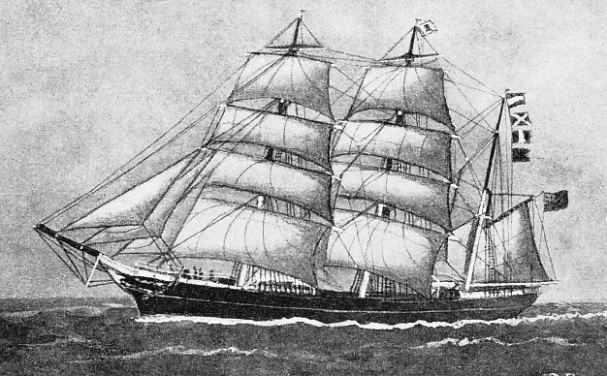 The Leucadia was built at Aberdeen in 1870. 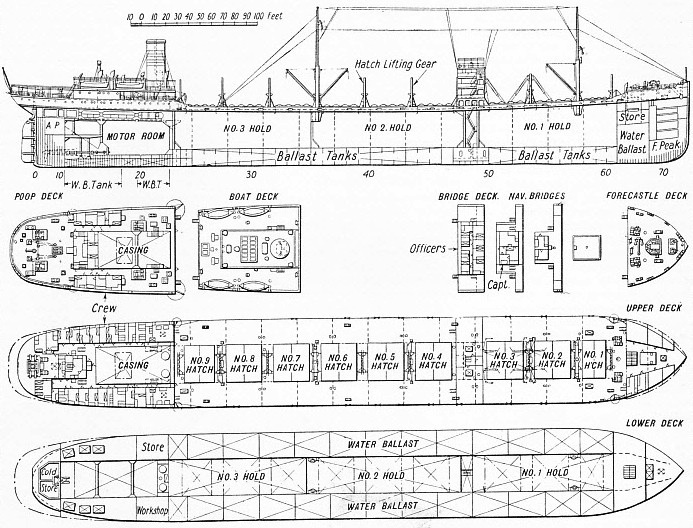 A vessel of 944 tons gross, she had a length of 194 ft 5 in, a beam of 33 ft 9 in, and a depth of 20 ft 5 in. She had a figurehead of the Greek poetess Sappho, and her hull was painted green with a yellow band. These extracts from the log of the late Captain James William Holmes describe graphically his experiences in command of some of the famous sailing ships in the last days of the glorious era of sail. In this chapter Captain Holmes mentions people he has met, storms he has encountered and ships he has commanded - ships the names of which are legends to the younger generation, but which were glorious realities to the sailors of the pre-war era. This article is concluded in part 42. The first part appeared in part 39. Captain Holmes’s reminiscences were collated by his daughter, Mrs Nora Coughlan, and later published under the title Voyaging: Fifty Years on the Seven Seas in Sail (London, 1965). Captain Holmes’s papers are now held in the State Library of New South Wales. A TWIN-SCREW MOTORSHIP of 25,550 tons gross, the Stirling Castle was built by Harland and Wolff Ltd for the Union-Castle Line’s South African Royal Mail service. She was launched in 1935. The Stirling Castle has a length of 680 feet between perpendiculars, a length of 725 feet overall and a beam of 82 feet. 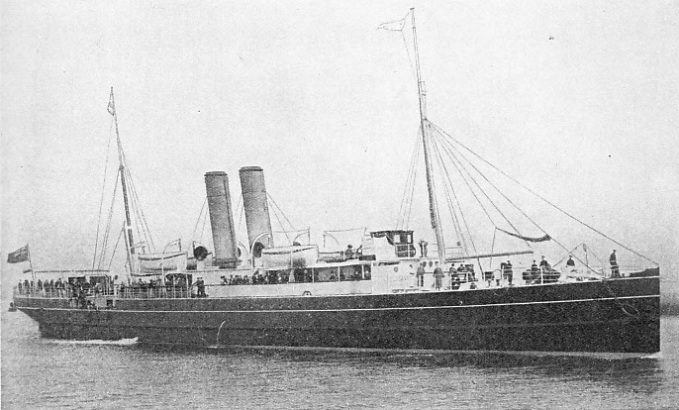 She has a curved stem and a cruiser stern, with two masts and a streamlined funnel. Her attractive colouring is shown by the colour plate. On September 4, 1936, she arrived at Capetown 13 days 6 hours 30 minutes out from Southampton, having maintained an average speed of 18.9 knots. She thus easily beat the previous record of 14 days 18 hours 57 minutes. THE ATTRACTIVE COLOURING of the Union Castle liner Stirling Castle, 25,550 tons gross, adds much to her striking modern appearance. Her hull is painted lavender-grey, which makes a charming contrast to her red funnel with its black top. 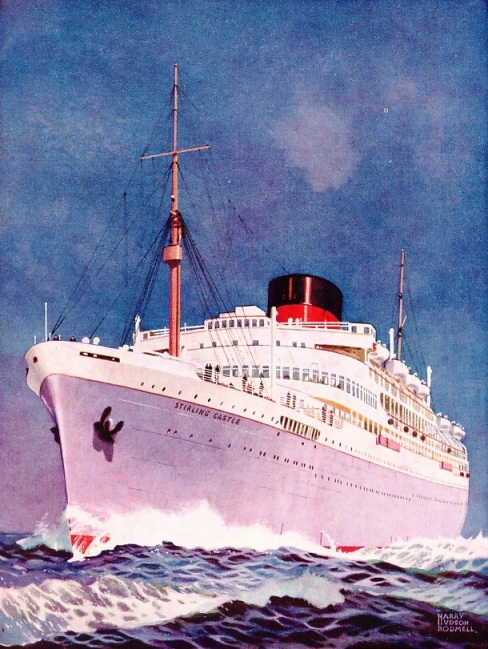 The Stirling Castle in 1936 broke a long-standing record for the voyage from Southampton to Capetown. The existing record had been set up as long ago as 1893 by the Scott, which did the passage in 14 days 18 hours 57 minutes. The Stirling Castle succeeded in making the same trip in 13 days 6 hours 30 minutes, at an average speed of 18.9 knots. She is propelled by ten-cylinder two-stroke double-acting diesels of the Burmeister and Wain type, and was built by Harland and Wolff Ltd, at Belfast.